Saggy skin is the loosening of skin on the body or face. DermMedica can help you restore a more youthful look. Sagging skin is a common sign of aging that may appear far earlier than it should, especially among those who work high-stress jobs or spend a lot of time in the sun. We can treat the early signs of aging and help you return to your true look. Through the use of gentle, modern technologies, we can make your skin appear tighter, smoother, and younger. If you’re interested in learning more, you can set an appointment here on our website. There are many ways we can help you. See the information below to learn more about what causes skin sagging and what technologies we offer to help. The most common reasons for saggy skin are aging, smoking and sun exposure. Over time, collagen and elastin depletes in our skin due to a variety of factors, but most notably genetic reasons. If you look like a family member who has very saggy skin then you are probably going to follow that same path without any type of intervention. However, there are definitely things you can do to slow down or treat saggy skin from taking its course on your face and on your life in general. Most importantly is to avoid regular sun exposure because UV radiation breaks down collagen and elastin in the skin quicker so you appear to age quicker. Simple solution. Don’t smoke is another one because smoking ages your skin by closing off blood supply to your skin which makes it harder to repair itself after damage. Eat a healthy diet with no processed foods, this is important because your body makes new skin cells all the time and what you put in your mouth will eventually become new skin and other body parts in the future so if you put low quality food in your mouth, that’s all your body has to work with as a nutritional supplement to make a new you. Get a lot of sleep, this is a simple one but sleep plays a huge role in our health and happiness so make sure you get as much as possible to enjoy what years you have on this big blue marble. What Are the DermMedica Office Treatments for Saggy Skin? What Is the Best Laser for Skin Tightening? In this category of laser treatments there really is no one BEST out of the bunch. There are multiple technologies that claim to perform skin tightening. The devices that claim this are lasers, radiofrequency devices, ultrasound devices and others. It really depends on the patient’s skin condition, age and desired outcome. Sadly, most of these treatments give little to no long term benefits for most patients but some of them can give some nice skin smoothing with mild toning/tightening results such as the gold standard CO2 laser. What Is the Best Way to Get Rid of Crepey or Laxed Skin on the Legs? We usually recommend a safe fractional CO2 laser treatment for this problem however multiple sessions are recommended to see noticeable results. Will Exercise Take Care of Extra Skin Caused by 3 Pregnancies? Weight loss will help bring the skin back to normal after pregnancy however sometimes saggy skin after pregnancy is all too common. Heat based technologies can sometimes improve skin sagginess but it is very patient-dependent. 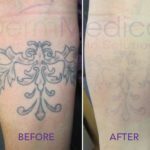 Results for laser skin tightening are permanent however your skin will obviously continue to age and this will cause more sagginess over time. What Works to Tighten Sagging Skin on Your Cheeks? We usually recommend and perform fractional CO2 laser treatments on the face for the best possible results. My Face Is Starting to Sag and I'm Only 21. What Can I Do to Help This? At this age we would not recommend any treatments because it is very unlikely you have true aging of the skin leading to excessive sagginess. We would have to see you in person to really assess if this is the case. Suggested Procedure for Loose Abdominal Skin and Stretch Marks? Stretch marks are essentially tears in the dermis of the skin and these cannot be fixed. Early on, we can perform laser treatments that can help shrink them to some degree when they are red. What Can be Done for Loose Neck Skin? Aside from surgery, we recommend some light laser treatments, multiple sessions are required. 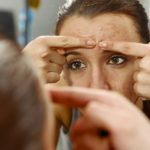 Is There a Way to Avoid Sagging Skin Face During and After Weight Loss? Avoid very dramatic and quick weight loss, this usually causes more sagging of skin in the short and long term. Lose the weight gradually over many months to achieve the best long-lasting results. How to Permanently Get Rid of Crepey Thighs and Knees? There is no reliable way to get rid of this problem in every patient although fractional CO2 is the gold standard treatment. Do Laser Treatments Really Work for Skin Tightening? The can work however you should anticipate multiple treatments and expect mild-moderate results that are very patient-dependent and vary between individuals. Why Should I Undergo Skin Tightening? Skin tightening treatments vary between patients in terms of results. Some patients have better success than others, mostly due to genetics, age, sun damage and lifestyle. Skin tightening can be quite dramatic for some patients and is permanent, however as we age laxity will appear over time.